From inky indigo and fresh periwinkle to rich sapphire shades, the interior designer David Collins was known for his deft use of blue and myriad jewel tones. His canny affinity with colour, paired with a sumptuous material mix, created decadent interiors that are at once elegant, glamorous, and seemingly timeless. As Collins himself explained, the key to this cohesiveness stemmed from the appreciation of nature in all of its beautiful splendour. “I would never use or wear a colour that could not be found in nature, having seen the extraordinary richness of nature’s spectrum,” wrote the Irish-born designer in the book ABCDCS: David Collins Studio. True to its title, the design tome covered the signature stylistic features and ethos of his eponymous London-based practice, and was one of his last projects—it was published posthumously in 2014, a year after his sudden, unexpected death. The Wolseley | St. James’s, London | Housed in a building designed by William Curtis Green in 1921, this former car showroom has been reimagined as a grand cafe and restaurant with old-world charm in spades. The resulting interior is timeless and steeped in European tradition. “Everything David designed had an unexpected charm to it,” recalls Rawlings, who is the incumbent creative director of the firm, overseeing the realisation of all projects across the board. “He’d always see things in a slightly different way and dare us as designers to challenge decisions—and not just do things that were the norm.” In May last year, The Ritz-Carlton Residences in Bangkok finally reached its completion—bearing Collins’ design imprint and his legacy. Blue Bar | The Berkeley, London | Opened in 2000, this striking bar at The Berkeley hotel covered the existing Lutyens-carved walls in a serene blue—a shade that envelops the interior like a precious jewel box. Crimson accents heighten the sense of drama of this space. Born in Dublin and educated at the city’s Bolton Street School of Architecture, the designer’s vocation began serendipitously in London. Collins had initially followed his architect father’s footsteps, but upon completing his degree, he decided to move to London to venture into interior design. His first commission involved the redecoration of a friend’s abode—by a stroke of luck, it was a home that French chef Pierre Koffmann visited. The chef was so impressed that he went on to work with Collins on La Tante Claire in Chelsea, which became the first restaurant he designed. In 1985, Collins and his business partner, Iain Watson, co-founded the namesake studio, which began to grow at a modest pace by specialising in small residential projects. A few years later, Collins would go on to design Harveys, a French restaurant helmed by then-unknown chef Marco Pierre White in Wandsworth. These restaurants, along with brunch institution The Wolseley on Piccadilly, marked the start of Collins’ lasting influence on the London dining scene, revolutionising the ways in which urbanites wined and dined in the city. Restaurants and bars became celebrated destinations and landmarks—stylish and distinctive venues to see and be seen at. 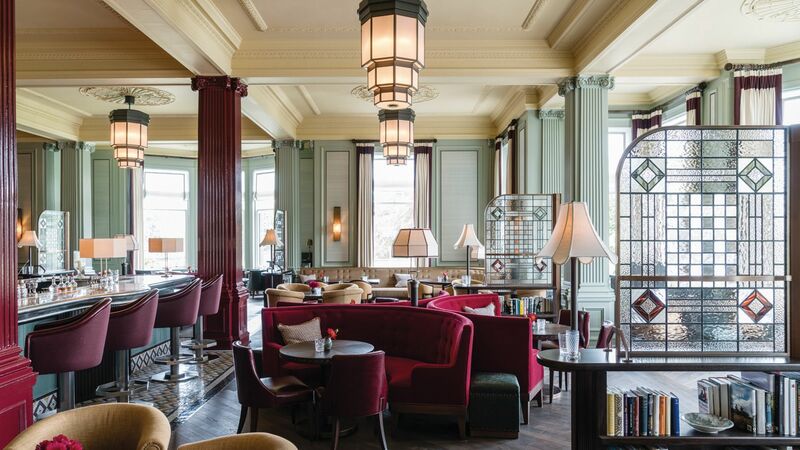 “When we created The Wolseley in 2003, that was the turning point,” recalls Rawlings.“It completely transformed the way that people ate in Central London—people actually wanted to go out to a restaurant for breakfast. It was the most memorable moment, seeing people walking in and not realising if the restaurant was 50 or two years old.” More key projects would follow, such as the Blue Bar, Claridge’s Bar, The Delaunay, Bob Bob Ricard, and Nobu on Berkeley Street. The studio’s attention to detail also elevated the quotidian sandwich bar to a refined experience—it designed the interiors, furniture, branding, and graphics for London-based chain Pret A Manger. Bob Bob Ricard | Soho, London | This Russian-style brasserie was inspired by romantic train journeys in the early 20th century. A plush mix of marble,velvet booth seats and ikat-inspired wallpaper decorate the dining spaces; the “Press for Champagne” button at each table adds a playful touch. Beyond restaurants, bars, and residences, the studio’s portfolio also encompasses a dazzling array of retail concepts, ranging from opulent boutiques designed for Alexander McQueen, Jimmy Choo and Bergdorf Goodman, as well as sprawling sections of the Harrods department store in Knightsbridge. At the same time, there were always unique elements created for each of these spaces, be it the gothic-inspired plaster panels for Alexander McQueen or the inspired mix of woven-mesh metal, mink velvet, and pink onyx for Jimmy Choo. “Hewas very inspired by fashion—David was very good at referencing art and fashion design, and that’s something we still do a lot of,” shares Rawlings.